One dreary day in mid February 2009 our convoy was south bound for adventure. The convoy was made up of our holiday bus, a 1952 Leyland Comet, with a 1966 Series 2a SWB Land Rover in tow on an A frame. Following behind was our recently restored 1970 Series 2a LWB 5 door Station Wagon. This was towing a little yellow trailer full of supplies... power generator, spare wheels, and plenty of food. Gosh! You ought to have seen how many packets of soup, and how many jars of jam we carried! Yes, enough to feed an army! Through rain and fine we made our way south to Lake Ohau over the next few days. 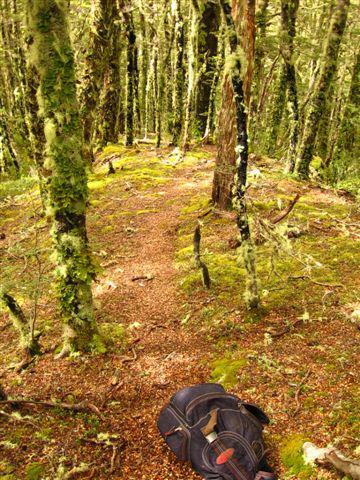 Finally arriving at the old NZ Forest Service Base Camp now maintained by Lex Perriam of Omarama, we setup our own base. Lex has kindly made this place available to us for a base at the lake. After getting things ready (this took a couple of days as we had to see DOC about some issues - see below) we finally started the great trek up the Hopkins River. It was fine sunny (and rather dusty) that afternoon we left the Base Camp. Lex Perriam and his good wife Jan were there to bid us farewell. We were all excited to really be starting the exercise we had dreamed of... the smiles were from ear to ear as we hung from the Land Rovers waving madly back to Lex and Jan! The two Land Rovers... one with a roof racked loaded up, and the other with a trailer in tow, made a fine picture chugging up through the many fords and river crossings. 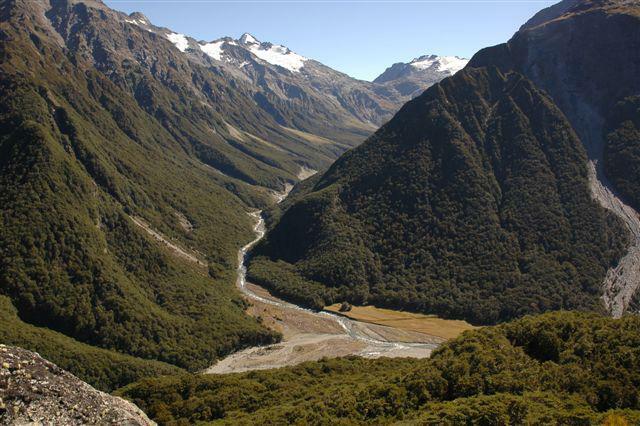 We got to the Huxley Gorge and soon found a lovely campsite at the entrance to the valley. It was a beautiful sheltered spot, near where the Huxley River meets the Hopkins River. 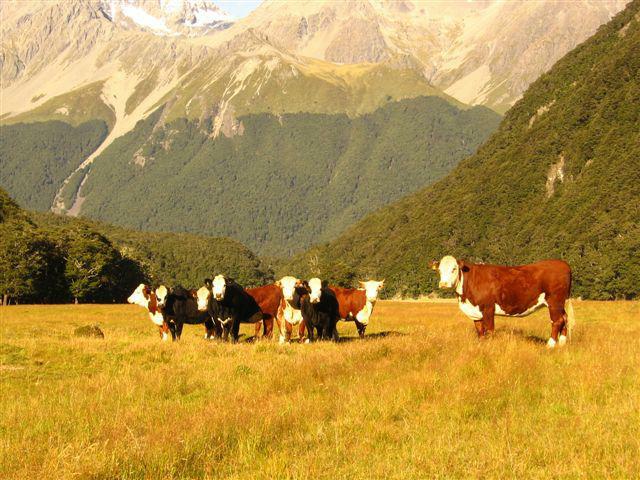 With native beech forest as the backdrop, we had the majestic Naumann Range to the fore. It didn't take long to erect all the tents... one tent for sleeping, one tent for a dining/eating room, a toilet tent and a shower tent. It was with great satisfaction that we finally slipped into our camp beds about 10PM that night. Next morning was quite foggy, but the sun slowly rose over the peaks to shine down into our valley. I (Adam Reeve) awoke soon after daybreak and wandered across the dewy grass to get a rabbit for breakfast! When I returned with my "catch" the rest of the family had arisen and were enjoying an early morning "stare". I joined them and we debated on what was the next move. We decided to go for a walk and check the area out again. But first we had the camp to tidy up! By the time we'd done that it was lunch time, then off we went. 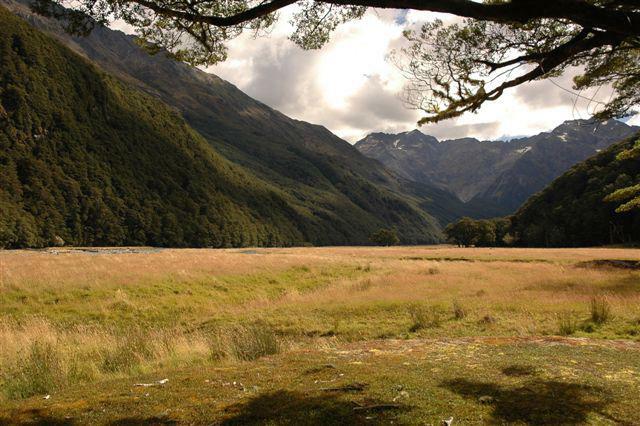 I went across the Hopkins River to try and catch a trout, and check out the lay of the land on the Red Hut side of the river. Simon and Bobbie went for a stiff climb up the ridge to the west of our camp... up to the south west of the swing bridge. And Mother? Well, Mother stayed in the camp to do the sort of things good Mothers always do! That is, sort and resort our clothes and just generally make things nice for the wanderers return later in the day. 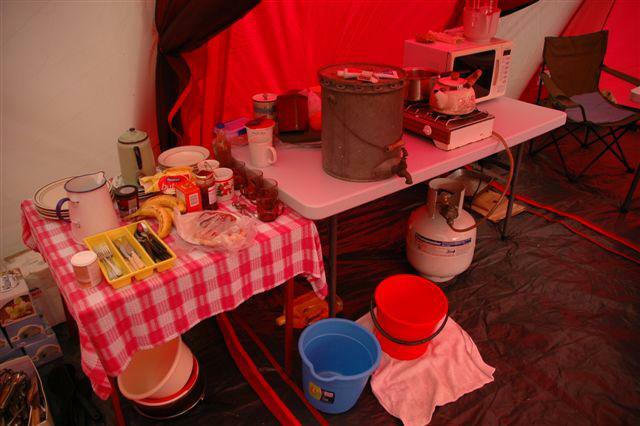 That night after a real camp meal of "tinned everything" we bedded down once more in our camp beds. However, troubles were lurking... as during the night the rain began to fall. And being so close to the main divide, it didn't just rain, it poured! It simply rain cats and dogs for hours and hours. A fine misty and VERY wetting drizzle it was. The sort of drizzle one only ever experiences in this type of country. 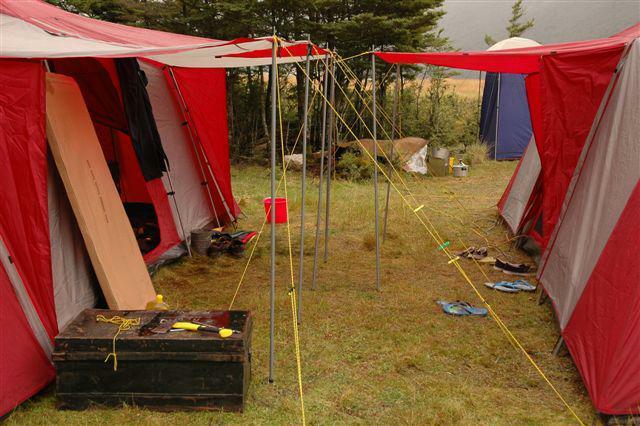 The outcome was that the I awoke in the early hours of the morning to find the roof of the tent collapsing with a huge water basin in the roof. A big pool of water had grown and filled up the roof so it sagged down almost to our beds. I got a dreadful shock, and awoke the others in a hurry. Simon and I pushed the roof back up... and the "puddle" disappeared with a rush. Hurrah! Upon the arrival of daylight we discovered that the "puddle" had returned, so we tried to tighten the guy ropes to stop it happening. After much more rain and several days, the river had risen to an alarming degree. To make matters worse, the ground sheets in the tents were leaking... the door zips let water in, and the only dry spots to be found were in the Land Rovers! So, as the rain was showing no sign of letting up, we decided to strike camp and get out before the river became uncrossable. 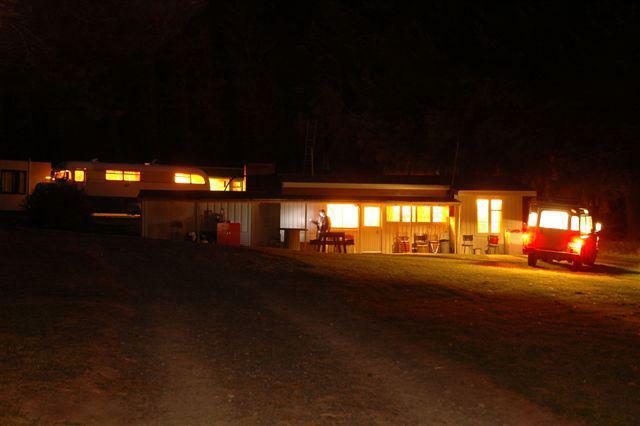 The "Front Door" to our home in the mountains! 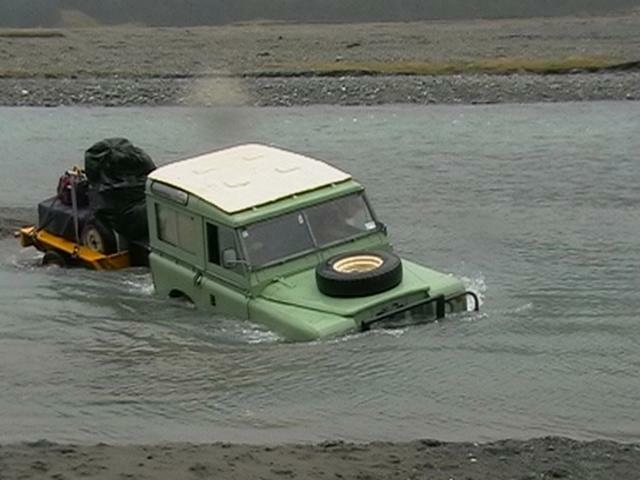 Simon and Bobbie took one of the Land Rovers down the river to the nearest ford to check the river condition. They radioed back to us to get everything ready. 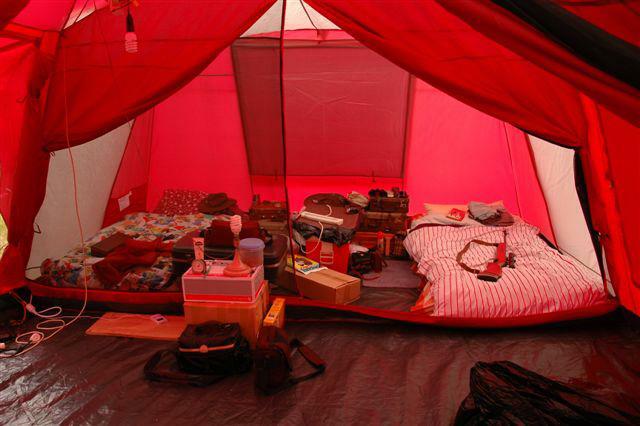 "Leave the tents, just take the bedding and enough food for a few days... we'll be back!" So my Mother and I rallied to the call and prepared to leave our lovely camp spot post haste. 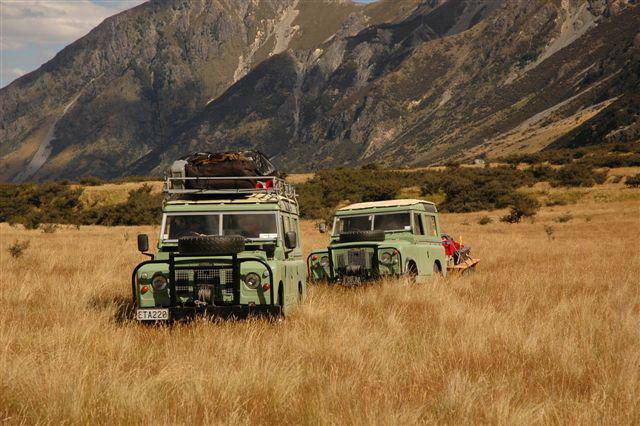 We loaded the Land Rovers and trailer with our gear and set off on the journey back down the river. We swamped the SWB Land Rover at the last river crossing, and had to tow it out with the other Land Rover... that's the reason why we need two vehicles in this type of terrain! 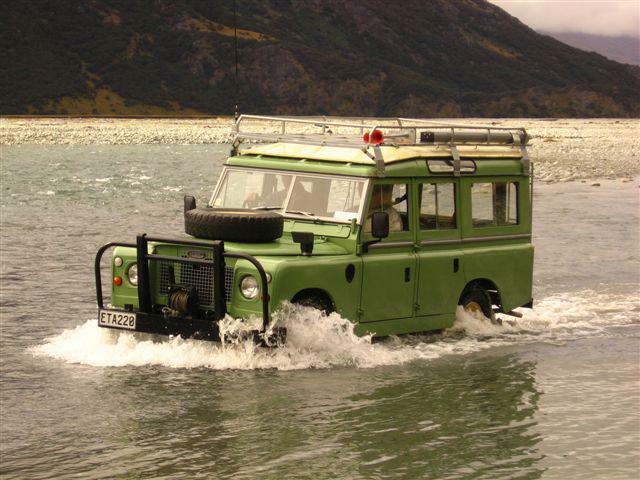 Once the Land Rover was back on the river bank once more, we opened the doors... and the "river" rushed out. The Land Rover was full of water! We had a large box of tinned food on the trailer behind the Land Rover which was totally submerged, and we had to be very careful that the labels didn't get washed off. Gosh! If that had happened we wouldn't have known what we were eating! Just imagine opening tinned soup when we wanted peaches! But we finally got out safe and sound, although considerable wet and rather cold. Back at our holiday bus, we lit the gas cooker and started to thaw out (and dry out to!) It was over a week before the weather cleared enough for us to return to our camp site up at the Huxley Gorge. Choosing a fine day we trundled our way back up the Hopkins River to collect the tents and the other gear we'd left behind. We decided there and then that tenting was out of the question in this wild location. It was far too wet an area to live in a tent. We needed something with greater weather protection. What and how were going to be two questions that would linger in our minds for quite some time to come! 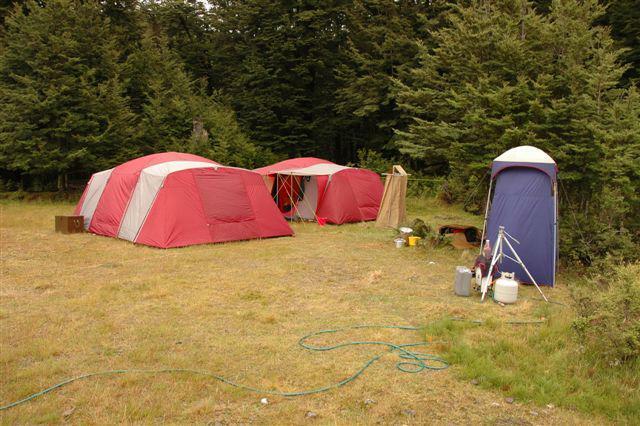 But for all the problems, we did not let the tenting problem hinder our search. In fact we realized just how much time was spent keeping the camp ship-shape. More time was spent in the camp that out actually searching! 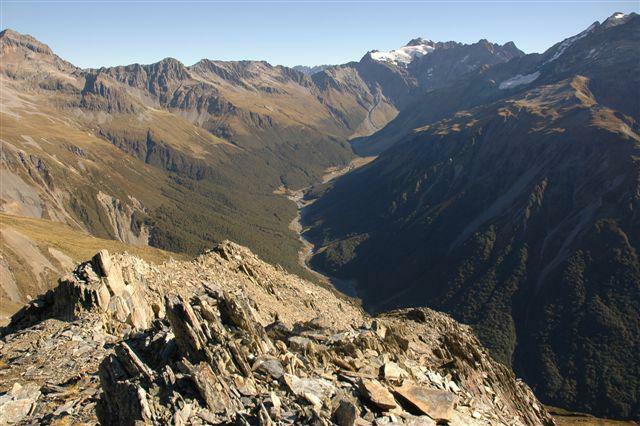 So each day we spent a few hours driving up to the Huxley Gorge where we could walk to all points of the compass. One day it was up to the Huxley Forks, another it was up the north face of the Huxley Valley. Basically we have been all over the area mapping the place from all vantage points to be able to narrow the search area down. 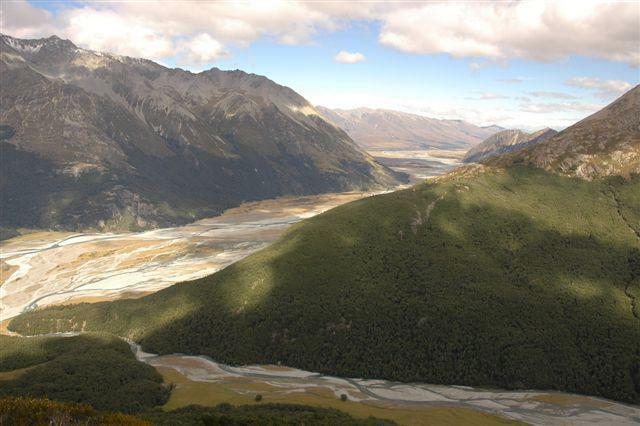 The splendid views we gazed upon from the majestic heights of the Great Divide were well worth the long weary hikes. 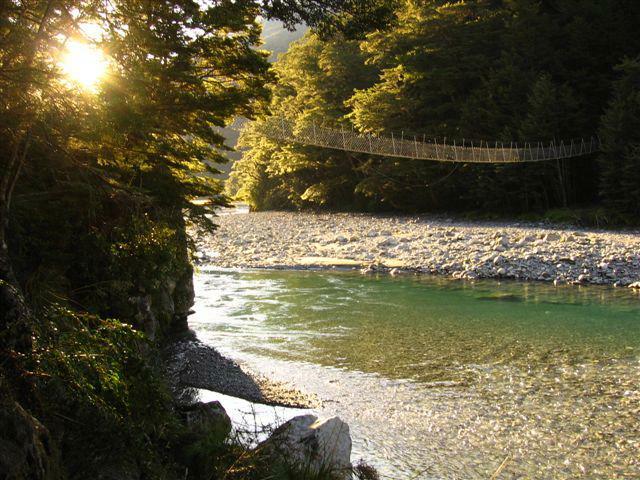 We would leave early in the morning, and arrive back at the base camp just on dark at night. Often when returning to the Base Camp in the evening we would shoot a few rabbits for the evening meal. Whilst up in the rugged peaks a sharp eye would be kept open for Chamois, Thar or Red Deer. We took a week off at one stage to drive down to Mandeville, to the Croydon Aircraft Company, to test the last remaining airworthy DH Dragonfly in NZ. We did a full range of performance tests with it... rate of climb, turning ability and more. It was rather strange to fly around at such heights in such a fragile aircraft. 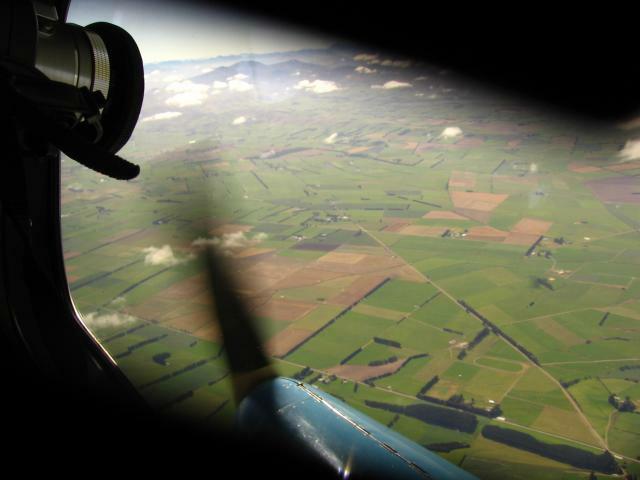 We felt pretty scared when the pilot did a 180 degree turn at about 115MPH! Our stomachs hit rock bottom! We were quite glad to get back onto solid ground at the end of the test flight. Having said that though, we wouldn't have missed this for worlds. It proved an awful lot really... not just the fact that we won't ever make good pilots! Once we returned to the Lake we were able to go to the various heights required to get film and video for mapping purposes. 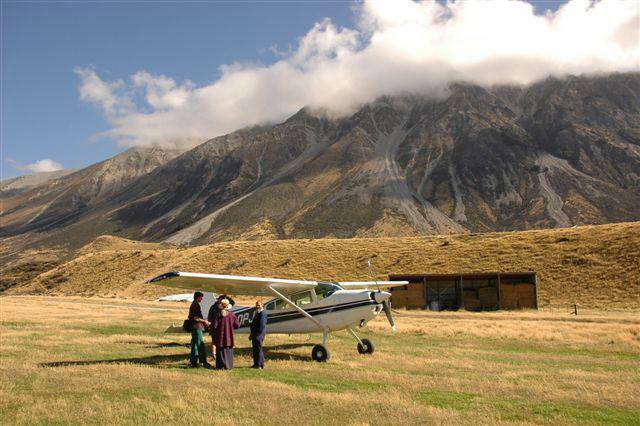 In addition to climbing many of the ridges and peaks to access key vantage points, we also summoned the help of local pilot, Brian Patterson, and his Cessna 180 to take us on a flight up through the many valleys from Lake Ohau on the course we believe Brian Chadwick would have taken. Carrying a GPS to plot the track, we were able to trace each turn or twist throughout the flight. To make the track as accurate as possible, the flight was made at roughly the height we believe the missing plane took. After our stay at the head of Lake Ohau we made a trip up to the top part of the South Island to visit two other aircraft crash sites. One was a DC3 that crashed at Port Underwood in 1948, and the other was a DH Dragon (a slightly earlier model to ZK-AFB) that crashed near Murchision in 1944. 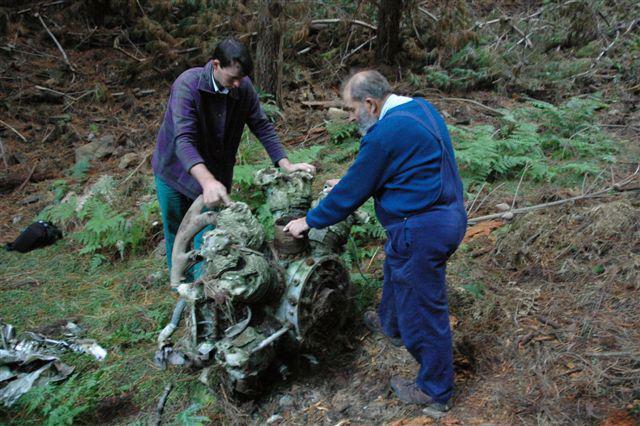 The DC3 had mostly been taken away, but a few metal parts remained, including an engine. 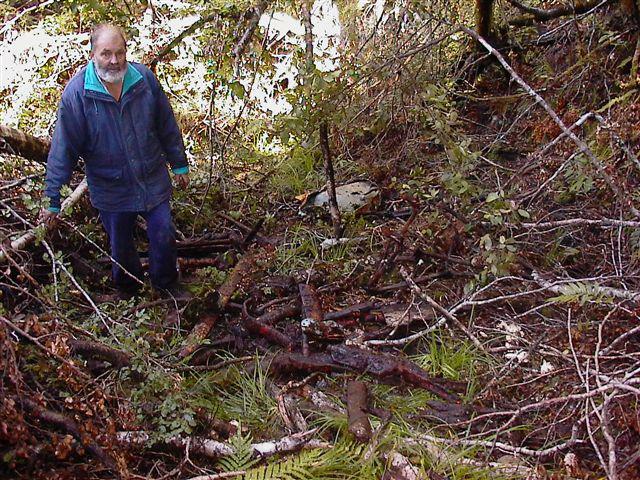 Poking around in the extremely dense wet undergrowth at the Dragon crash site we found lots of wood that wasn't even rotten! It was broken up, but not rotten in the least. This has given us much hope for finding ZK-AFB reasonably intact. Both crash sites were a long way from any access way, which meant a lot of walking to get to them. 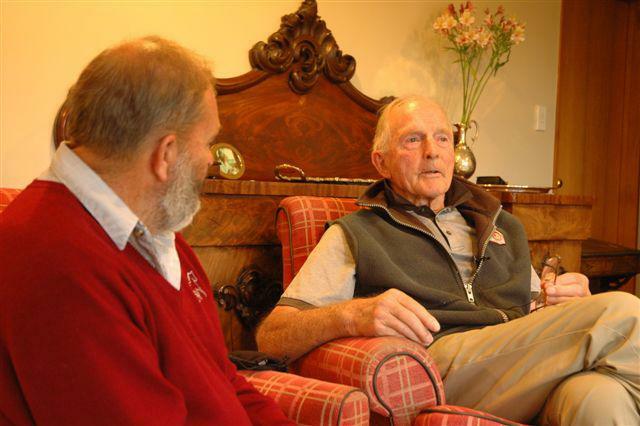 Whilst on our travels we have met many retired pilots who either flew in the search or had a lot to do with Brian Chadwick. By interviewing these people we have managed to built up a picture of the man and also of the weather conditions on that day, the 12th February 1962. As people have come to know what we are doing, the support has been extremely encouraging. People from all walks of life have come forward to offer assistance in various ways. We are very grateful to those people. However, it must be said here that we are saddened by the lack of support from the Department of Conservation. They have shown themselves to be more fond of monetary gain than in helping to solve one of New Zealand's greatest mysteries. After more than a few meetings and phone calls with their management, we are unable to come to any lasting agreement. Don Middleton, a retired pilot, remembers the tragic last flight of ZK-AFB well. We're a film company... never mind how big or small, but we are a company who makes films for a living. We don't begrudge DOC for wanting payment for concession fees, but we do dislike the manner it is demanded. For instance, they want about $500 per day that we are filming in the area. Not a difficult problem? No, I agree. But just how many days, and what days do we film on? They want to know which days we will film? How can we tell this? That's a mighty hard question indeed, for they have forgotten something quite simple... we are looking for a missing 'plane. We are looking for the crash site first and foremost, and the filming comes second. And another thing. What do we film in the area anyway? Well, that's an easy answer... we film each other doing things, just like any other family would do. DOC says we can film for personal use on land managed by them, but we are unable to film on the same land if the video or photos are for commercial use. Answer: What about the thousands of overseas tourists who visit each year? We have spoken to many overseas visitors who are writing books and things... and they have been collecting footage for commercial use. What about them we asked? Do you really know what the reply DOC gave us? They said, "Well, two wrongs don't make a right!" On top of this there is another catch. This is the time limit. We can get a concession for a day or a month. It can be either for a day or 1 week, or 6 weeks. We tell them how long we want it for. Very good, that's fair enough. But is it really? What about if I get a concession for a week. Once that week has passed how can DOC tell what time or date any footage was taken? What about footage taken the year before, or the year after? So long as no-one see's us taking the film at the time, how do they judge when it was done? After all, it could have been taken in that week long concession I got. We questioned DOC on this and their reply was that they relied on peoples honesty. Have you ever heard of such a thing? A business relies on another business to be honest when there is no legal grounding... no hard solid facts? This is the kind of thing DOC is doing. We would not mind paying for a concession if there was a fairer system... in fact we have asked if we can pay for the actual film we use in the film as at this stage we cannot know what we will use. How on earth can DOC tell what we film is for personal use or for commercial use until we produce a video? They can't! We can't! It's totally impossible, and its on this reasoning that we totally refuse to pay any concessions. You will be asking what sort of filming we are doing whilst searching for Brian Chadwicks 'plane. To answer this you must keep in mind that we are a family just like any other. We do the same silly things, make the same stupid mistakes and generally get around just like any other Kiwi family. Whilst searching for the crash site we'll carry a video camera or two with us. This will be purely to capture footage of ourselves. We will be the subject... the background will be the scenery DOC wants us to pay for. How can we, the searcher photographers tell what is personal use and what is commercial use? How can we ever draw a line down the middle? And anyway, why should we? As New Zealanders we feel that any such fees should be waived in recognition of this exercise... one with such historical significance. 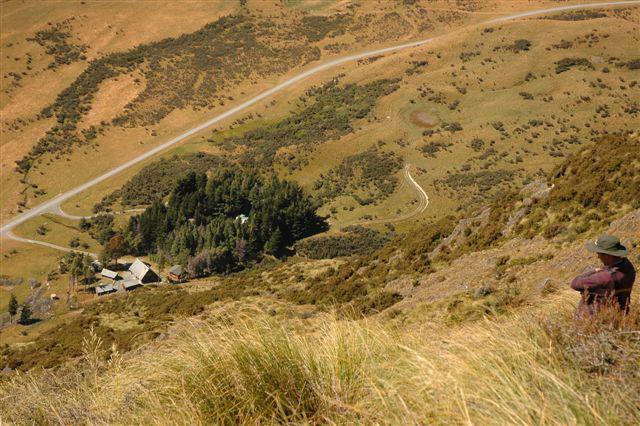 Everyone has been so helpful that we feel very sad that New Zealand's Department of Conservation is the only organization who is proving so unbearably difficult to work with. 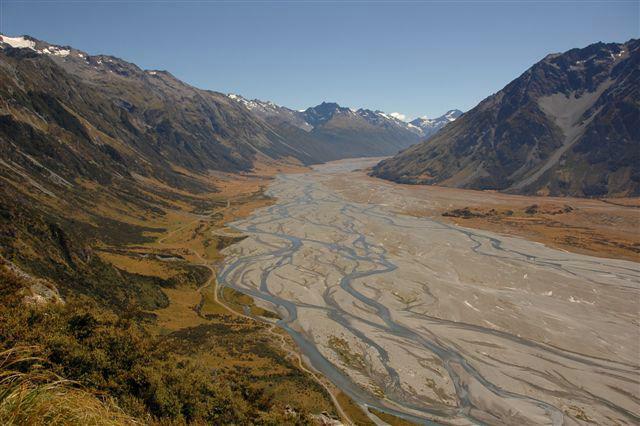 The Huxley Forks where the North and South Branches of the Huxley River converge. This view is looking up the North Branch with the Brodrick Pass in the far distance. And lastly, we are worried that any fees we pay will be used to benefit the proposed 1080 poison drops which we are totally against. We are very concerned at the amount of damaged caused by the willy nilly dropping of poison into our fair land. We will on no account support this treacherous and uneducated move! Back to the Dragonfly Search... and in conclusion, we have come home for the winter to plan a second expedition that will go forth in the Spring of 2009. We have found that camping out in a tent to be far to time consuming (although fun in itself) when looking for the crash site. Driving 16+ miles up a rough river bed prior to hiking around steep mountain sides each day is enough to give anyone achy bones! We are considering the use of a Jet Boat to go up the Hopkins River, thus saving us the 2 hour journey each way in the Land Rovers. In the Spring we hope the river level will be high enough from the "Thaw" to allow this. When the water level is up, the Jet Boat would give us access to each side of the Hopkins without us getting wet feet! But all this is ideas at present. Time alone will tell how the next expedition will unfold, but it will be exciting preparing for it. Keep a watch on this site for new updates. pondering on who we are, and why we have trespassed in their domain!